"I wanna play on that rocker thingy over there!" "Well, I want to ride the twirlly thing!" You might think grade one students were being interviewed. But, no. 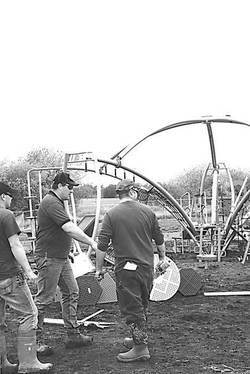 These were adult volunteers from the community, and beyond, who came to the Thorsby Elementary School playground on May 30-June 1, 2013 to assemble a futuristic looking playground from sturdy silver, royal blue, and red parts. Halfway assembled, and using a little imagination, the equipment could easily pass as something that might be found on a K Days midway! Even half-finished, it embodies the promise of a lot of fun. On Thursday, the very first day of the weekend-long project, it didn't seem to matter to the volunteers that they were digging holes in the pouring rain. "They were up to their knees in mud!" said the official project mover and shaker extraordinaire, Shawna Ofstie. "It was so challenging. Everything was more difficult because of the rain; but they didn't complain—they just…DO! I am so impressed with the way the community pulled together to make it happen." The pumper truck for the cement had to be cancelled because it was making deep mud ruts, leaving the cement to be hauled by hand and by Bobcat. No worries. No complaints. Just lots of team spirit—this is the stuff of which those from Thorsby are made! Thorsby Elementary Parent Association (TEPA) President Kim Chung, who organized the volunteers, said the community not only helped with the building, but also with homemade food contributions. Seven or eight high school students dropped by to help. Then, there were the corporate volunteers. "Thirteen ATCO Gas employees showed up from the surrounding area, Wetaskiwin, Edmonton, and even Calgary to volunteer through their Day of Caring program," said Chung. "They even brought us a BBQ lunch!" Chung noted that the Bank of Montreal, KollBrook Esso, and Proactive Solutions also showed corporate generosity through donated meals. On Sunday, Chung was thrilled to report the volunteers had finished at 6:30 Saturday evening, a day earlier than expected. "It only took two full days. It is not completely done because of a few missing parts; but the wood chips are coming on Tuesday and then we should be done with what can be done.” A basket swing and a cube climber will be coming from Finland later. Chung credits the speedy assembly to the amazing workers—a total of 115 on site over three days—some with kids currently in school, some with kids not quite ready for school—who plied their tools, volunteered their construction expertise, or directly helped support those who did. The $240,000 playground was designed by Peak Play Sales & Distribution of St. Albert. TEPA fund-raised an awe inspiring $130,000.